Moyes not only lambasted the completely inept performance of Mark Clattenburg in that game, his comments also called into question the integrity of the referee's decisions. Which has to be the most serious accusation you can level at an official. Human error is a fact of life and we all have to accept that referees will get decisions wrong, but the suggestion that their decisions can be influenced by factors outside of the game itself opens up a whole other debate. And one that, it appears, the FA do not want to get involved in. That was until the <?xml:namespace prefix = st1 ns = "urn:schemas-microsoft-com:office:smarttags" />Liverpool captain appeared to intervene and the referee pulled out a red to reduce Everton to 10 men. As if that wasn't bad enough, he subsequently gave Dirk Kuyt nothing more than a booking for a diabolical two-footed, knee high lunge on Phil Neville that, on any other day, would undoubtedly have seen the flying Dutchman walk. Then, having awarded Liverpool another penalty and sending off Phil Neville in the last minute, two decisions no-one could argue with, he failed to award Everton a clear penalty deep into injury time when Jamie Carragher clearly tried to suplex Joleon Lescott in the penalty area. Carragher (red trunks) executes a suplex on Lescott of Everton...NO PENALTY! Now any manager would rightly admonish the referee for such a catalogue of errors in one match, but there was something different about David Moyes' reaction after the game as he seemed to suggest that something more sinister may have been at work. 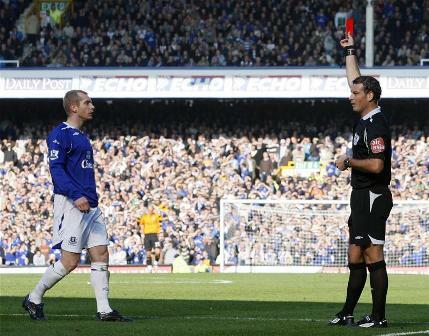 Moyes said of Hibbert's sending off: "I am not convinced about the first penalty. It was the coming together of two players. Steven Gerrard's arm goes across Tony Hibbert's before they come together and I think Gerrard slipped. Tony Hibbert did not make a tackle. He added: "The referee pulls out a yellow card and then the Liverpool captain has a word with him and then it becomes red." Whether it was actually a penalty is open for debate but you can see why the referee gave it, as Gerrard sucked Hibbert right in and went to ground at exactly the right time, but it's way the referee changed his decision and opted to send Hibbert off, seemingly, at the behest of the Liverpool captian, that really stuck in everyone's throat. And for Moyes to suggest that Clattenburg's decision making was so blatantly influenced by another player should certainly have him heavily punished if the accusation was not accurate. So we can only assume that the accusation was true. Moyes also added: "The game was not decided by the players but by the referee" and added "Didn't Clattenburg go to Hong Kong with Liverpool for the Asia Cup this summer? Maybe he wants to be their friend." These comments, again, clearly imply that the referee's decisions were not solely influenced by what was happening on the pitch, but also by his relationship with the Liverpool players. 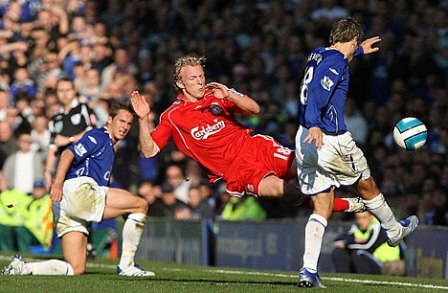 How else was Dirk Kuyt's 'tackle' - and I use the term very loosely there - not worthy of a red card? I'm sure he's probably a great guy off the pitch, and even gets the Lucozade in after the game and everything, but that doesn't give him free reign to kneecap an opponent because he's been muscled off the ball seconds beforehand. Again, as these charges have been dropped, we can only assume that the FA believe Moyes' comments carry some weight as he could have been looking at facing libel action and not just an FA charge for questioning Mr Clattenburg's integrity in such a manner. And, if the FA do feel there's some truth in what Moyes has said, this must have some serious implications for all referees and Mr Clattenburg in particular. But so far he has suffered no consequences for his display in that game as, although the FA did comment at the time that he wouldn't be refereeing any games the following weekend, this was due to him being on holiday rather than through any sanctions imposed upon him. This is something I find astonishing given the fact that Rob Styles was dropped for a week and forced to issue a groveling apology to the Liverpool management team after he did nothing more than award a dubious penalty against them during their 1-1 draw with Chelsea. How many times are dubious penalties awarded over a weekend? And how many times do referees wave away penalty appeals when it's clear an offence has been committed in the area? And how often are the officials forced to make public apologies to the teams concerned?! An interesting aside to this whole debacle surroundings Mr Clattenburg is his record in matches he's refereed involving Man United this season. United have lost just three games this season, two of which have been refereed by Mr Clattenburg as they lost 0-1 to local rivals Man City and Bolton. Sir Alex Ferguson was so dismayed by Clattenburg¹s handling of the game that he spoke out about the official, saying: "You expect a team near the bottom to battle, scrap and fight. But the key thing is how the referee controls it. He is the arbiter in terms of the application of the rules of football. That is where we feel a bit aggrieved." Although Ferguson admitted using foul and abusive language towards the official, his rant appears to be nothing more than what any manager of his ilk trots out when his team has taken a bit of a kicking and hardly compares with the accusations Moyes made towards the official. But for this Ferguson was fined £5,000 and given a two-match touchline ban! And Clattenburg has subsequently refereed one more Man United game this term and that was the weekend's 1-1 draw at Tottenham. A game that they were losing 0-1 until the last minute and one in which they had seven players booked! It's pure conjecture, and probably mischief making to suggest that an official from the North East would show any sort of bias towards Liverpool but his display in the derby coupled with his record in refereeing Man United this season certainly gets you thinking if nothing else! But, despite having the charge dropped, David Moyes isn't out of the woods just yet as he still has one charge hanging over him relating to the comments he made leading up the UEFA Cup game against Larissa. A game that took place on the Thursday after the derby when the Everton manager was still fuming over the previous weekend's events. But Moyes ire in the lead up to this game appeared to be focussed more upon the penalty claim that was turned down in the last minute and Mr Clattenburg's reasons for not warding it than any of the other incidents. And the controversy centres around a meeting that Moyes had with Clattenburg just after game as the Everton manager explained at the time: "I've since seen it [the penalty appeal] a few times but I know the real story and what's really gone on from the referee and his comments to me ­ so if the FA really want to hear the real comments than I can explain them." He added: "It was also witnessed by John Barnwell from the LMA (League Managers Association) so we know exactly what was said and what the referee's thoughts were because I got a chance to speak to him 30 minutes after the game." These thoughts are clearly more measured and sound like a direct challenge to the FA to charge him and risk some serious mud raking.